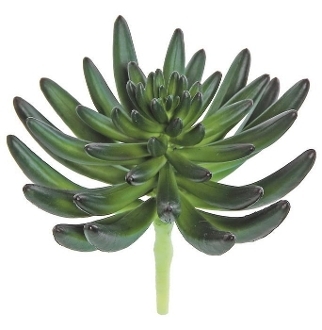 Finger Succulent Permanent Botanical For Miniature Fairy Gardens. INCREDIBLY REALISTIC - WE CANNOT BELIEVE HOW REAL IT LOOKS EITHER! Scaled perfectly for gardens, it will add color for indoor or outdoor design. Flexible branches and nice full size to create shade for your fairies. 5.5" Wide Head. No Need to Water! We work closely with our vendor to source the most realistic in both touch and look for you fairy garden. These are the same botanicals we use in our own showroom for in-store customers.